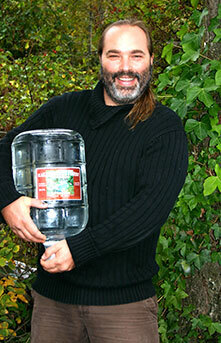 In operation since June 2007, Saltspring Water Co. continues to meet the growing demand of Salt Spring Island residents, offering something simply ageless - pristine spring water. Rhonan Heitzmann and business partner Fitz Lee are proud to be able to provide a quality product at competitive prices along with personalized service. The water! The quality of the spring water, which is in the top 3% of all the water in the Gulf Islands, is matched only by its fresh, natural taste. Customer service is a top priority. We listen to our customers' needs and concerns and will do everything in our power the ensure they are satisfied. We are 100% Island owned and operated, which means that when you purchase our water, you are supporting the local economy. Our deliveries are regularly scheduled once every 2 weeks. See the schedule for dates of delivery to your area. If you require it less frequently or wish to be on our 'will call' list, just let us know! We provide a variety of container sizes and accessories, along with home delivery of bulk municipal and spring water. 100% Saltspring Island Owned and Operated :: Copyright 2018 Saltspring Water Co. :: All rights reserved.